It was a hard-fought Game 1, but Alex Ovechkin and the Capitals came out on top thanks to Joel Ward’s goal with 1.3 seconds remaining in regulation. Photo courtesy of MSG Photos. In an emotional, hard fought game that saw the Rangers tie the game with less than five minutes to go, the Garden crowd was left stunned following a questionable no call, and a Rangers’ defensive lapse allowed Joel Ward to score with less than two seconds in regulation, sealing a victory for the Capitals. The Rangers came out of the gates blazing, and it looked like they were ready to totally take over the game. They were controlling possession, getting shots on net, and came close on a few occasions, but Holtby stood tall and the team defense from Washington was strong. Eventually, Hart trophy finalist Alex Ovechkin took over the game, and the Rangers did not do a great job of containing him. Ovechkin dominated possession when he was on the ice, with a 71% corsi for during the first two periods. He also scored on the power play, again, the fifth time that he has scored on the man advantage against the Rangers this season. Going forward, Vigneault needs to do a better job of limiting his influence. It was a duel between goaltenders, with strong performances from Henrik Lundqvist and Braden Holtby. Lundqvist certainly had the more difficult saves to make, but let one squeak through the pads late. But Henrik made a ton of great saves that kept the game very close. Holtby had way too many clean shots, often unscreened and not giving up any rebounds. 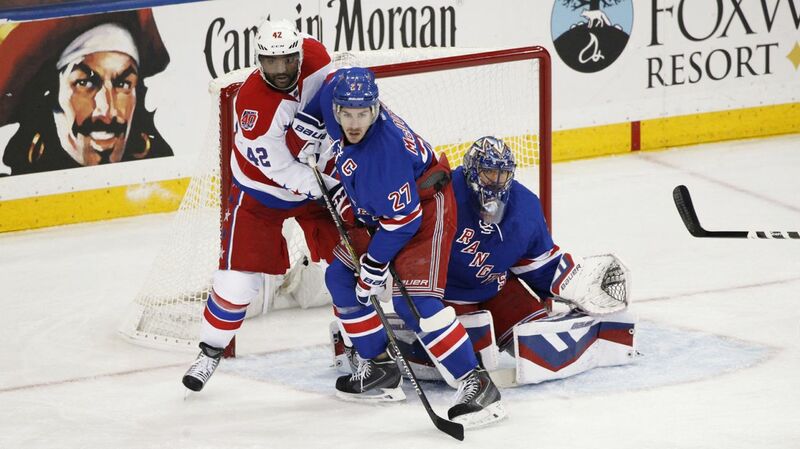 Regardless, he played well for the Capitals, and continues to be a thorn in the Rangers side come postseason play. Henrik Lundqvist had a tougher workload in this game, but played well throughout the game, keeping the Rangers in it until the very end. Photo courtesy of MSG Photos. While the pressure from the Rangers was good for large portions of the game, the scoring chances weren’t all that great. Holtby didn’t have a lot of traffic in front of him, the Capitals defenders did a nice job of blocking shots and clearing the few rebounds that he left, and there were a lot of harmless bad angle shots. Vigneault needs to get his guys to start getting higher quality chances. The ice looked to be tilted in the Rangers favor early in the game, totally controlling the pace of play early on, and nearly scored. JT Miller redirected a puck in front, and it went just wide, deflecting off of the outside of the post. Slowly but surely, the Capitals began to combat the Rangers speed, using their physicality and forechecking to pressure the Rangers, and stopping their pace down the wings. The turning point of the period came when Dominic Moore was sent to the box for holding, and the Capitals had their first play of the night. Lo and behold, it was Alex Ovechkin scoring the goal on the power play. Surprisingly, it wasn’t a one timer from the faceoff circle, but instead when he rifled a wrist through Dan Boyle, surprising Henrik Lundqvist and finding the top left corner of the net, giving the Capitals a 1-0 lead. The second period was similar to the first, with the Rangers starting the period strong and pressuring Holtby and the Capitals. But like the first period, Washington’s defenders were able to keep the Rangers shots around the perimeter. They started getting bodies to the net, but could not get anything past Holtby. Alex Ovechkin came close to scoring again, ringing a wrist shot off of the crossbar. With the Rangers continuing to pressure throughout the third period, they would finally get one past Braden Holtby, and it was Jesper Fast scoring his first career playoff goal. With Zuccarello out of the lineup, Fast was promoted to the third line alongside Kevin Hayes and Carl Hagelin. The third line pinned the Capitals back in their own zone for a while, and Hayes made a nice play to keep the puck in at the near the blue line. He quickly turned and fired a shot on net that deflected off of a Capital, and then off of Jesper Fast’s leg, finding the back of the net and tying the game at one with 4:39 remaining in the game. Jesper Fast celebrates after scoring his first playoff goal of his NHL career. Photo courtesy of MSG Photos. With seconds left in the game, it looked like these two teams were headed to overtime. 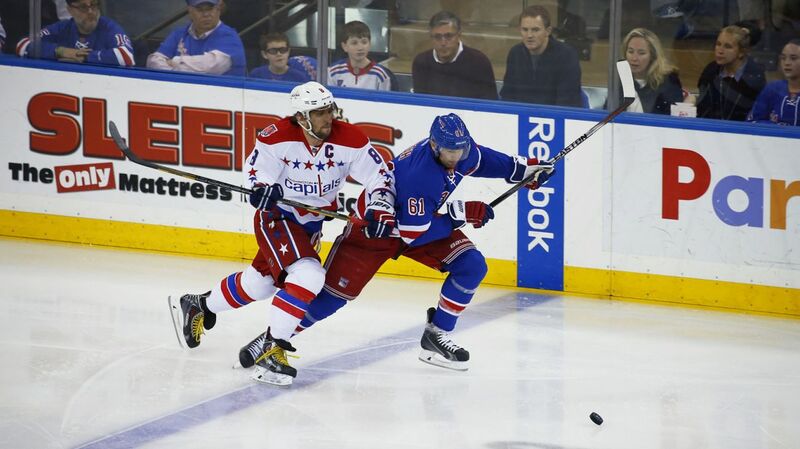 But the Capitals kept up their forecheck, putting pressure on the Rangers. Dan Boyle attempted to pin the puck up against the boards, and Backstrom stapled him into the boards with what looked like a hit to the numbers, or to the head. Boyle went down, and the Rangers seemed to stop playing. With no whistle, and nobody covering the front of the net, Ovechkin made a great pass to Joel Ward in front of the net, and his wrist shot snuck underneath the pads of Henrik Lundqvist, and Washington had the lead with 1.3 seconds remaining. Backstrom’s hit was very close to being boarding. Dan Boyle was up against the boards, and Backstrom skated over to make a hit. Boyle’s back was facing Backstrom, and the hit looked to get him on the right side of the back, near the numbers, driving his head into the boards. 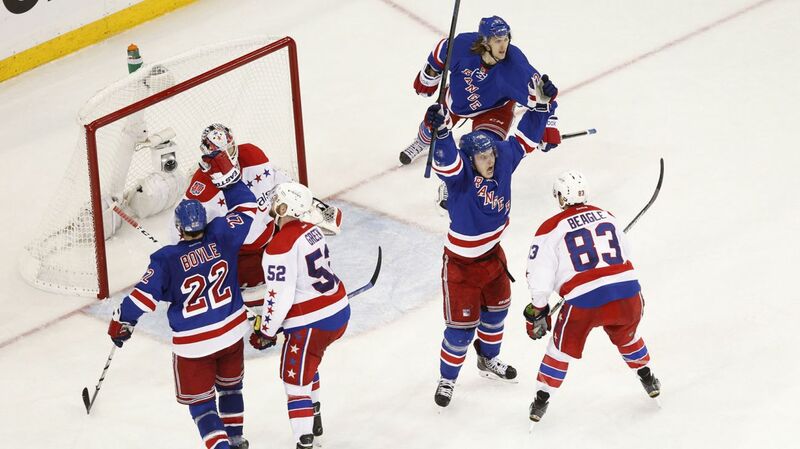 The Rangers skaters stopped playing, expecting a call, and the Capitals capitalized. It’s frustrating because a borderline boarding call went against the Rangers, directly leading to the game winning goal. And this isn’t the first time the Capitals have gotten away with a hit from behind. In the series against the Capitals, there were other hard hits from behind against Thomas Hickey, Lubomir Visnovsky and John Tavares, none of which got called. The referees have to start calling these dangerous hits from behind, and the Capitals need to get called for it. If they don’t, then it’ll keep happening, and someone will get hurt. But the Rangers weren’t all that effective throughout the net. They outshot the Capitals, but they were mostly from the perimeter. If they want to score on Holtby, and generate more offense, they need to get the puck to the high danger areas of the ice, and stop falling into the Capitals’ trap. I also want to see more from Rick Nash. I’m not bashing the guy, and his four points in six games, but he seems to have lost an edge in his game. He’s hasn’t been playing hard against the boards like he used to, or carrying the puck to the front of the net. Most of the time it’s just harmless wrist shots from bad angles near the boards. The Rangers need him to step up big time, and need his production. The Rangers will look to bounce back in Game 2 at MSG on Saturday Afternoon. Posted on May 1, 2015, in Game Recaps and tagged Alain Vigneault, Alex Ovechkin, Braden Holtby, Cam Talbot, Carl Hagelin, Chris Bourque, Chris Kreider, Dan Boyle, Dan Girardi, Derek Stepan, Derick Brassard, Dominic Moore, Hartford Wolf Pack, Henrik Lundqvist, James Sheppard, Jesper Fast, JT Miller, Keith Yandle, Kevin Hayes, Kevin Klein, King Henrik, Madison Square Garden, Marc Staal, Martin St. Louis, Mats Zuccarello, Matt Hunwick, MSG, MSL, New York Rangers, NHL, NHL 2014-2015 Season, NHL Playoffs, Nicklas Backstrom, NY Rangers, NYR, Rangers, Rangers Nation, Rangerstown, Rick Nash, Ryan McDonagh, Stanley Cup Playoffs, Tanner Glass, The Ranger Zone, Washington Capitals. Bookmark the permalink. Leave a comment.